New moms find emotional support in online communities. Rachel Turley Ligairi (BA ’04, MA ’06) is a reserved person who says she doesn’t make friends easily. So when she became pregnant with her first child in 2008, she was grateful she had started a blog because it helped her meet like-minded women and find broad support during the transition to parenthood and beyond. By blogging about her experiences as a new mom, Rachel Ligairi built a nurturing community where parents share the trials and joys of raising children. Ligairi’s experience is typical of many of the 157 “mommy bloggers” recently studied by former psychology student Brandon T. McDaniel (BS ’10) and his faculty collaborators Sarah Money Coyne and Erin Kramer Holmes (BS ’98), both assistant professors in the School of Family Life. 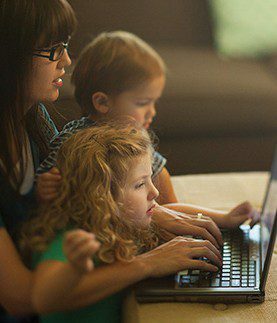 They found that moms who blog feel more connected to their extended family and friends. “That seems to snowball out into other areas of their life—their feelings of broader social support and their general well-being. They feel less parenting stress, and that ultimately leads to less depression,” says McDaniel, lead author on a recent article in the Maternal and Child Health Journal. McDaniel, now a doctoral student at The Pennsylvania State University, says they found that higher marital satisfaction and less marital conflict are often associated with blogging. Today about 4 million moms blog. And while there’s no way to know how many blogs are written by Latter-day Saint moms, the number appears to be disproportionately large compared to the Church population. Many think of mommy blogs as treacly prose and cheery photos and assume they don’t have much purpose beyond bragging about kids or sharing craft ideas and recipes. Actually, mommy blogs vary widely. Some serve as glossy digital scrapbooks while others offer frank narratives that explore thorny angles of mommy angst, from postpartum depression to the alarming colors of new-infant poop. Juliana Hacken Montgomery (’01) says she was shocked by her new life as a mom and needed a safe place to express her frustrations. “Everyone around me acted like being a mother was just joy and peace all the time, but they didn’t talk about how much of a struggle it was. I wanted to affirm to myself and others that you’re still a good person, even if parenting is really hard for you,” she says. So she created the blog True Confessions of a Mormon Mother (blog.geekuniverse.org), where shewrites openly about her struggles with depression, anxiety, and raising an autistic son. McDaniel became interested in the transition to parenthood when some close friends became new parents. McDaniel, who didn’t have children yet, watched as his friends faced radical changes in their lives in a short period of time—readjusting their roles as spouses, learning how to care for a new infant, experiencing sleepdeprivation. Based on his observations and on his coursework at BYU, McDaniel started his own parenting blog (parentsareimportant.com), where he saw parents share information and offer support to each other. And then in 2009 he and his wife, Jalisa, transitioned to parenthood themselves. She started a blog (patchesofpink.com), and he noticed how she and other women found comfort and reassurance as they reached out to each other online. The study also looked into social networking sites like Facebook, but activity there did not correlate with feelings of social connectedness or well-being. McDaniel theorizes that for some mothers such sites are too public and don’t provide the more intimate, trusting environment of a blog. Faculty collaborator Holmes says the study “landed in a really great journal and has gotten tons of buzz.” Because blogging and social networking are so new and have been studied so little, it provides an important start, she says. The idea that average marital satisfaction decreases after the birth of children is backed by research, but Holmes says it’s a pet peeve for her that only the average gets publicized. “The research reports much more diversity in new parents’ marriages. Publicizing average declines sends the message that your marriage has to sink when children arrive. If you expect it to decrease, it might be more likely to happen.” A closer look at the research shows that some marriages stay the same and others report better marital satisfaction. One such group is mommy bloggers. When Holmes first became a mother about a decade ago, she was a doctoral student specializing in the transition to parenthood and considered herself an expert on the topic. Even so, she wasn’t prepared. In an upcoming article, Holmes and her coauthors argue that expectations should be broadly defined in areas of intimacy, finances, and a baby’s needs. “People seem to transition better when they’re willing to learn to reach out to others, to recognize that the transition is challenging, to not be too discouraged when challenges come up, and to know how to get information and then actually get it when they need it,” she says. • Be aware that becoming a parent can place you at risk for decreased marital satisfaction and self-esteem. • Gather information about your new infant’s needs, your wife’s needs, and common changes you can expect in your marriage. Being well prepared buffers against depression. • Come to agreement with your wife about discipline strategies and how to divide household and child-rearing responsibilities. Finding ways to support each other in these efforts will help you feel more competent and involved. • Know that couples don’t need a strictly “equal” division of labor to feel good about their marriage or their transition to parenthood. But research does suggest that expressing appreciation for each other’s efforts to achieve balance increases men’s involvement in childrearing. • Be aware of common areas of marital conflict for new fathers: chores and division of household labor, financial pressures, relationship difficulties (such as communication, spending time together, and affection), balancing career and family, social isolation, and having less free time.